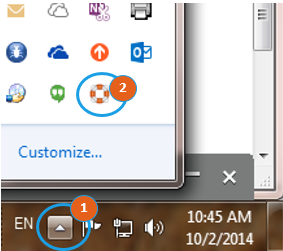 If you have a CompuCARE contract, you have a little icon in your system tray that makes it easy to ask for help. If you don't see it there, try clicking on the little arrow to Show hidden icons. Once you've found your CompuCARE icon, right-click it, and you'll see our phone number as well as 2 options. Open a ticket: This will take you to our online portal, where you can open a new ticket directly. Email Screenshot: This will take a screenshot, open a new email, attach the screenshot, and put in our support email address. This is great if you're seeing an error, a popup, or there's anything else on the screen you want our technicians to see. Describe your problem in the email body, and click Send. This will also open a new ticket in our system, and send a return confirmation by email. 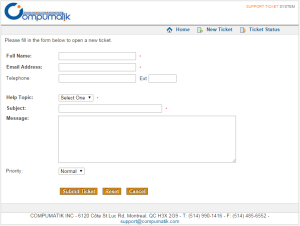 You can also go directly to our support portal, at http://os.compumatik.com, and fill in the new ticket form. A support request will be opened in our system, our technicians will be alerted, and you'll receive a confirmation by email. From our online portal, you can also check on the status of existing tickets by clicking on Ticket Status in the upper-right-hand corner. You can always email our support team directly at support@compumatik.com to ask for help. 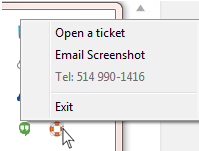 This will open a new ticket under your name, alert our technicians, and send a return confirmation by email. You can always call us at (514) 990-1416 to speak to a technician directly.